Is your website feeling stale? How does it look compared to your top online competitor? Chances are, it’s time for some digital spring cleaning. Let’s dive into a few ways to freshen up your site so that people stick around and aren’t embarrassed to share it with friends. Web design in 2018 is clean, sleek, and super fast. It’s image and video heavy, but very light to load on mobile with AMP. (Do we even need to mention your site must be responsive and mobile friendly or face penalties from the big G?) Choose a design that appeals to you, is easy for people to navigate, and includes a call to action for your product or service. Including a free offer so that people sign up to join your email list is a great idea too. As most people know, the search engine algorithms are changing every single month. Some of these can be significant, causing our pages to lose their rankings. For those that are using search engine optimization experts to manage their website, they will likely be working very hard to achieve and maintain your positions. However, if you would like to do a little spring cleaning, so to speak, of your website to prepare it for what will happen in 2019, it’s actually very easy to do. There are just a few modifications that you need to make to ensure that your new posts will rank as high as possible. Be sure that your pages include relevant keywords that people will be searching for. Long tail phrases are sometimes even more powerful than shorter keyword phrases. Updating your metadata will also make it possible for you to have the best chance of maintaining all of your current search engine positions. One of the most important on-site optimization strategies that you can use is always using unique content. It is recommended that the content be 800 words in length or longer, and this will include curated content as well. However, for your existing content, you might want to do updates. This is going to help you not only maintain the positions that you already have, but potentially move those positions higher. In the proverbial mind of the search engine algorithm, you are updating in order to provide better content for your visitors and therefore they will reward you. If you are embedding video on each page that you post, this is a strategy that can work very well. It is useful when you are creating a YouTube channel, and then posting that video on your website or blog. This will help you rank in Google, which is always a good thing since that’s where most people go to find your products and services. More importantly, you might want to update descriptions on videos that you have right now, something that will force the search engine spiders to reindex part of your page, specifically your new video. This change can actually be beneficial if the video you are now using has much better content in the title, description, and keywords of that video. It also shows that you are making an effort to provide new and improved content for your visitors which, just like unique content, and updating the content, is going to work to your advantage. One final thing that you can do as you are doing your annual digital spring cleaning is to make sure that you are getting traffic from social media channels. If your site isn’t getting the traffic and generating the phone calls or sales you’d like, we can help you understand why. Fill out the Discovery Form here for a free consultation. 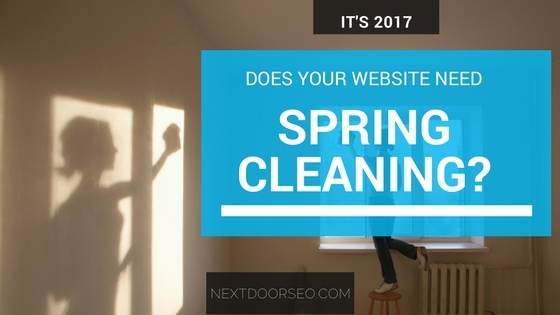 These simple strategies for spring cleaning your website to help improve your positioning online in 2018 are going to help you generate more traffic. Not only will you be able to rank more pages, but you will see that some of the pages that you have which are not yet at the top of the first page listings might move in that direction. These changes are designed to make sure that you are able to accommodate the updates in the search engine algorithms. It’s really the only way that you can continue to rank as high as possible in the search engines and generate quality traffic. If this article was helpful for you, please share it with others so that they can benefit! And of course, you can always contact us for assistance with growing your online presence. Thank you Graham! I’m glad that AMP has helped increase the visitors to your site. It’s something that I do for all of my clients.